Size of this preview: 800 × 532 pixels. Other resolutions: 320 × 213 pixels | 640 × 426 pixels | 1,024 × 681 pixels | 1,280 × 852 pixels | 1,996 × 1,328 pixels. 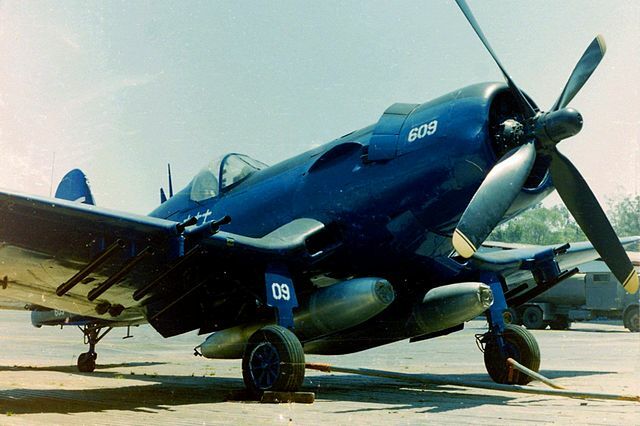 English: A Vought F4U-5NL Corsair (U.S. Navy BuNo 124715) on display at the Museo del Aire, Tegucigalpa (Honduras). This aircaft was sold to Honduras (s/n FAH-609) in 1956. In the so-called "Football War", Cap. Fernando Soto in FAH-609 shot down a Salvadoran air force Cavalier F-51D Mustang and two Goodyear FG-1D Corsairs on 17 July 1969 during the last known air combat between piston-engined aircraft. FAH-609 was finally retired in 1981.